Creative Resilience: The Next Sustainability for Tourism? by Alan A. Lew – this is a brief summary of a paper that I am working on – originally posted on my TG Tourism Place blog. ‘Sustainable development’ has really only been around as a popular conceptual framework since the World Commission on Environment and Development (WCED) issued its report to the United Nations in 1987 (Hall & Lew, 2009). Also known as the Brundtland Report, its goal was to define a global agenda to deal with the deterioration of natural and social environments. Today, 24 years later, sustainable development and sustainable tourism are widely accepted as appropriate philosophies upon which to base policy decisions and behavioral practice. Their wide acceptance is due, in part, to the flexibility used to interpret their meaning. Unfortunately, that flexibility may have made both sustainable development and sustainable tourism meaningless. Increasingly extreme climate events related to increasing atmospheric green house gasses (GHG). Increasing global population (reaching seven billion in 2011) putting more pressure on natural resources. Increasing extreme geologic events (earthquakes and tsunamis), in part due to growing populations in dangerous locations. Economic recession and financial crises, especially in the US, the Eurozone and Japan. All of these changes, among others, are taking place despite widespread commitments to sustainable development across the globe. It appears that sustainable development in general, and sustainable tourism as one of its forms, has failed to meet the demands of contemporary society, and are even being overwhelmed by them. Resilience theory offers an alternative to the sustainable development paradigm. Community resilience is the ability of a place to maintain a normal level of service in the face of periodic or unpredictable external shocks or system failures. One way to think of the difference is that sustainable development tries to prevent the shock event from occurring (by behaving more responsible toward the environment and society), whereas resilience planning focuses more on the response and recovering after the shock event. From a human settlement of community perspective, three general approaches to resilience planning have been suggested (Davoudi 2012): Engineering, Ecological and Transformational. Engineering resilience is the ability to return to a normal equilibrium after a disturbance and emphasizes the efficiency and predictability of bouncing back. Ecological resilience is the ability to learn from an adverse event so as to be better prepared for future shocks, which may involve an alternative form of normalcy. Such learning includes institutional capacity building and understanding individual social capital opportunities and needs. For example, the SARS epidemic decimated tourist arrivals in many Asian countries in 2003 because they were caught unprepared to address this type of catastrophe. Similar disease issues have arisen since that time, but policies and practices adopted since 2003 have successfully kept them mostly under control, protecting the tourism industry. These practices include isolating travelers who are severely ill and regularly disinfecting elevators and other strategic locations in public places. Engineering and ecological resilience represent the traditional goals of community resilience planning and both assume that there is a normal level of social equilibrium that can be achieved. Most the new interest in climate change resilience has tends to focus on these traditional approaches. However, as community resilience planning has become more widely examined by social scientists and community planners, a third form of resilience has emerged. It is define as the capacity of a community to invoke whole systems changes, reflecting different timelines and geographical scales, that evolve and create new adaptive models of response to changes in their natural and social environment (Planning Theory & Practice). I call this Creative resilience because resilient societies are those that are able to continuously re-create themselves to successfully adapt to an ever changing world. Disturbances range from large, sudden shocks to gradual and consistent shifts, from the unpredictable to the expected, and from the undesired to those that are welcome. Communities and people build resilience by continuously responding to disturbances in creative and adaptive ways. Creative capacity building is occurs through effective leadership, individual social capital, and institutional social learning. To me, a resilience approach makes a lot more sense in today’s world, with today’s challenges, than does a sustainability approach. While much of sustainability also supports resiliency, resilience planning is more directly related to the immediate challenges of a community in a real and practical manner. Creative resilience also offers a wider range of possible responses and visionary futures than does sustainability, which is more narrowly focused on conservation approaches. For tourism, does this mean that we will replace green certifications (such as Green Globe) with resilient certifications, or at least incorporate resilience into the certification criteria? I think that we may actually see this some day, though not in the near term as resilience is still an emerging approach. For tourism destinations, however, the question arises as to what is the more important and effective policy for local and regional funding and political support: sustainability or resilience? Instead of sustainable tourism, should we be promoting resilient tourism? And what would resilient tourism look like? My own fieldwork in Asia indicates that the answer to this last question is very much dependent on the context and needs of the tourism entities involved. 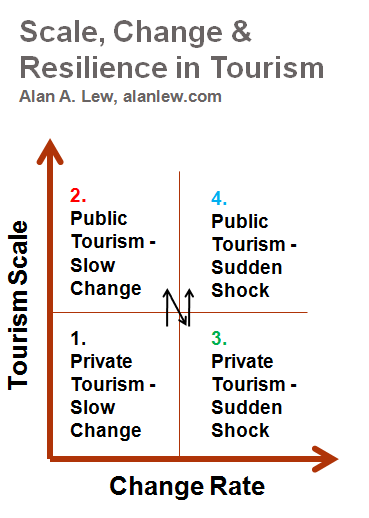 Figure 1 shows how four generalized types of tourism settings based on the degree of disturbance (from gradual shift to sudden shock) and the scale of tourism (from private entrepreneurs to shared public interests) that are involved. The Change Rate axis recognizes that people perceive and manage slow, but still significant, changes in the environment, culture and society than they do with sudden shocks to these systems. In addition, the model recognizes that rates of change can be highly variable over time and at different social and geographic scales, which can require different modes of response. 1- All tourism destinations face a range of change pressures, including environmental (changing natural resources), social (changing cultural resources) and economic (changing economic conditions). 2- Some pressures for change are apparent and predictable, while others are opaque and unpredictable. 3- Pressures for change occur at a variety of time lines (speeds) — some are slow and gradual, while others require urgent responses. 4- Traditional sustainable tourism planning mostly addresses slow change issues. Engineering resilience planning mostly addresses major disruptions. 5- Pressures for change occur at a variety of geographic scales — some only impact an individual entrepreneur, while others impact an entire community or cultural group. 6- Lower geographic scale issues need to be incorporated into resilience planning that occurs at higher geographic scales. 8- A slow change pressures may be transformed into a sudden shock event if it passes a tolerance threshold (or breaking point). 9- Comprehensive resilience planning should incorporate the full range of change pressures that a community faces, and encourage creative and flexible response. 10- The tourism industry needs to be included in community resilience planning. Hall, C.M. and Lew, A.A. (2009). Understanding and Managing Tourism Impacts: An Integrated Approach. London: Routledge.